With this Pedi spin Callus Remover, you can neatly say goodbye to calluses in just minutes. The rotating buffing head removes rough patches, calluses and dead skin. With this callus remover, you can buff away the patches, then open it and toss the shavings. 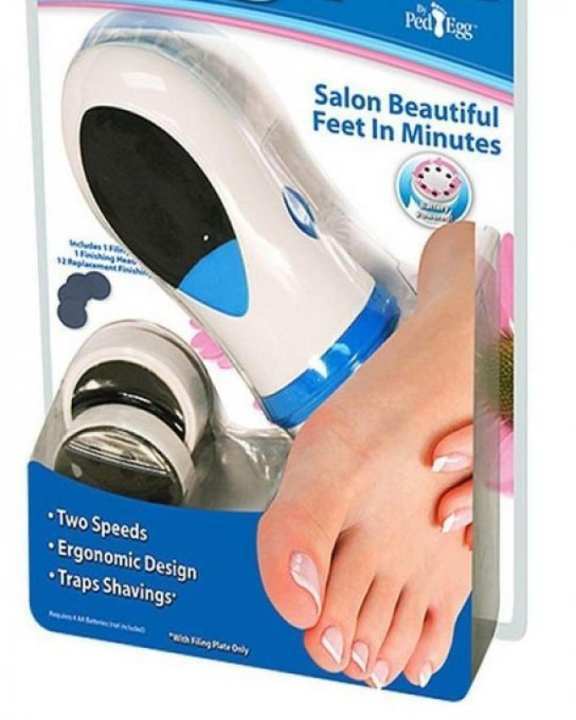 This item can also be used on delicate skin on your heels, soles and toes.Specifications:Enjoy salon beautiful feet with the PediSpin Portable Automated Callus Remover!Easy, painless way to enjoy smooth, soft feet.Includes buffing & finishing pads to remove dry, rough patches, calluses & dead skin.Ergonomic, lightweight & portable design.Low-speed option for sole & toes exfoliation and high-speed option for callus removal.Shavings collect in the head for easy clean up.